The Alpaca is the smaller of the two main breeds of domesticated camelids from South America. It exists only in a domesticated state and was bred by the Incas and other “Indian” tribes in the Andes, prior to the sixteenth century Spanish Conquest of that country. For some years Alpacas were believed to have evolved from the wild Guanaco of South America but recent DNA testing has shown that the Alpaca elvolved from the wild Vicuña. (For details see » Origins and Relationships). 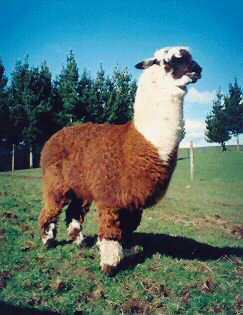 Nevertheless, Alpacas and Llamas can interbreed and produce fertile offspring. Although occasionally eaten, Alpacas were kept mainly for their long, lustrous fleece. They were highly valued and even revered by their owners. Until 1863 they were very difficult to obtain outside their country of origin, with South American governments, especially that of Peru, banning their export. Alpacas were first imported into New Zealand in 1865 by the Provincial Government (in Wellington), which found them unproductive and sold them to the Rhodes Brothers at Purau on Banks Peninsula in 1869. Initially there were five Alpacas at Purau, and although they bred, the total number never exceeded fifteen. One account notes that “they never mixed with the sheep and always stuck to the part of the run where they had been first turned out. They would not work for a dog; so the shepherds mustered them with stockwhips, like cattle. They were brutes to shear. Their legs had to be tied to stop them kicking and their heads bagged to stop them spitting green slime. The shearers refused to shear them; so the shepherds (or probably more often the manager) had to do them.” This early introduction appears to have died out. Another two that were imported to Oamaru, North Otago, in 1878, did not breed. These attractive animals are often highly priced but have some advantages over other farm livestock, especially on smallholdings. They require a low level of care and are easily maintained animals which can survive on grass and water. Unlike sheep, they do not get footrot or flystrike and do not require docking. They defecate in selected areas and their padded hooves are easy on fragile pastures. Alpacas are modified ruminants, not only eating less grass than other animals but converting it far more efficiently. The Rare Breeds Conservation Society is grateful to members of the » Alpaca Association New Zealand for some of the information used on this page.